What did style women wear in the 1940’s? Two friends discuss their dress, hair and makeup before the big dance occasion. 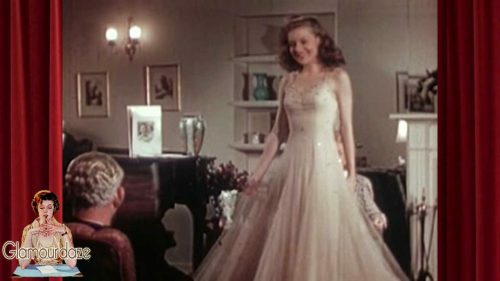 Correctness in 1940’s evening dresses, like other matters of etiquette, is something which has to be learned. Watch the film below. One needs to check on herself and inquire from those who know, what is correct. Women usually have more training than men in the etiquette of dress, because of its importance to their appearing always to their best advantage. But girls have their problems too. What they think is in good taste may not be. Naturally every one he or she likes should be correct. Many girls are inclined to over dress. Even the word of her parents is not always accepted. Mother is called old fashioned. But here for instance, Margaret will take Helen’s word for it, that she is wearing too many ornaments. Simplicity is always the safest policy in ornamentation. Correctness in the choice of dress for an occasion, not only includes the choice of gown and shoes. But the hairdo, accessories, the jewelry and yes, the face makeup. The rules are logical, simple and easy to remember. And they are very important. Now that the girls are ready, it’s on to the dance with their dates. Frank, who’s date is Helen, is a little at sea with dating rules and etiquette.